This Set pack includes 2 pcs of 1" Sling Swivels and 3 screws. Black finished, Super Heavy-Duty, Quick and Easy Installation Fits Wood and Most Synthetic Stocks & Forends. 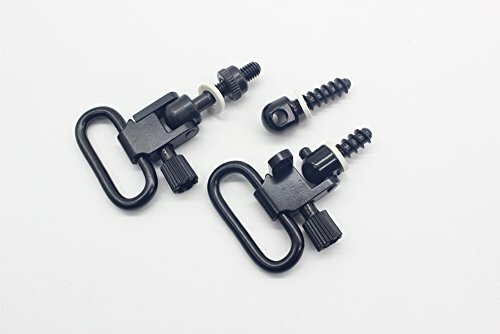 This swivel with screws set is the perfect way to mount your sling to your favorite rifle or shotgun with unique Quick Detachable (QD) design. Quick Detachable Super Swivel is easy to remove a sling from rifle.Detach quickly and provide positive locking for safety. Three-lock design for optimum security against accidental opening of Sling Swivel from Rifle.Machine Screw type and wood screw rear base. Made of High Tensile Strength Metal with fine black finished. Fits Well With Any Sling Swivel Studs. This Kit comes with 3 Sling Studs: 2 Screw in and 1 Bolt in with nut, white spacers. Studs will work with both Wood and Synthetic Stocks. Fit for 1 inch Sling.